DriverMax is a new tool that allows you to download the latest driver updates for your computer. No more searching for rare drivers on discs or on the web or inserting one installation CD after the other. Just create a account, log in, and start downloading the updates that you need. You can also export all your current drivers (or just the ones that work ok) to a folder or a compressed file. After reinstalling Windows you will have everything in one place! 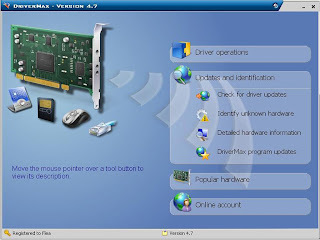 DriverMax only works on Windows Vista, Windows XP and Windows 2003 (all service packs). Driver downloads are *only* available for Windows Vista and Windows XP users.